Inviting a rabbit to your kids party or event is a special treat for the kids; their faces light up when they see the rabbit and also when they pet the rabbit afterwards. Mr. McGregor is a rabbit who is tame and sits comfortably when kids pet him. As is common with a house rabbit, Mr. McGregor is litter trained. Mr. McGregor is a rabbit trained to be part of the magic show at a kids party. Rabbits are used in magic shows, because they have a natural ability to sit still. A rabbit can sit in a hiding place until the moment when the magician “pulls the rabbit out of a hat”. Mr. McGregor does a great job at a kids party for this reason, but also because he’s a rabbit who enjoys getting affection from kids. Unlike every other rabbit though, after a hard day working at parties for kids, this rabbit heads home to spend the rest of the day playing in his indoor rabbit playground or munching on grass outside. Pulling a rabbit from a top hat is considerably the most iconic trick of a magician. 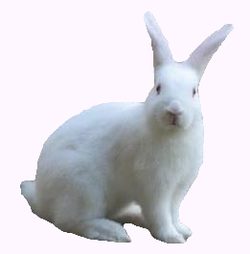 A puppet or plush rabbit is commonly used nowadays, due to the required care of using a live rabbit. Using a live rabbit in a magic show not only requires the proper care of the rabbit day-to-day at home, but also the proper transportation of the rabbit to the kids party, temporary housing during the entertainment, and handling of the rabbit during the magic trick. Pulling a rabbit from a hat is very difficult to do in a way that does not cause distress to the rabbit. Firstly, a rabbit needs to be hidden in a suitable sized space for only a very short period of time and secondly a rabbit definitely cannot be lifted by it’s ears or by the scruff of it’s neck. A magician must find a trick which is suitable for the proper care of a rabbit, which does not necessarily involve “pulling a rabbit from a hat”.